Figs are one of the oldest cultivated fruit, preferring a dry, warm climate with a chilling requirement of 100 to 300 hours below 7oC. They are normally associated with Mediterranean climates but can be grown with good results in the milder areas of the UK. With the advent of a warming climate, figs become an interesting possibility for amateur gardeners in many areas. Figs, picked from your own tree when they darken are a delight. They may not produce so profusely but are a bonus to other, more commonly grown fruit. Fruit need a dry period when maturing otherwise they may split. Trees need a sunny position against a fence or wall for protection against frost. 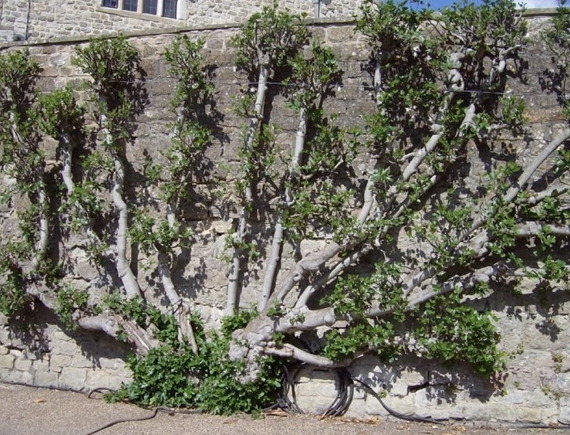 Fig trees are vigorous, growing to 10m tall and as they are self fertile, thankfully, only one is needed. 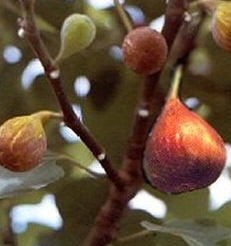 Figs produce two different crops of fruit, an early crop of embryo fruit formed late the previous season followed by a second on the new growth. In their natural environment, they form a well-shaped tree that needs little attention but we are growing them on the edge of their range and must take advantage of any protection the garden can offer. To fan-train a fig, choose two of the best shoots and tie down as for peach and prune the tips lightly. The fan is developed from lateral growth, allowing greater space to allow for the large leaves. Prune back in winter to remove old, fruited wood, leaving the younger wood. 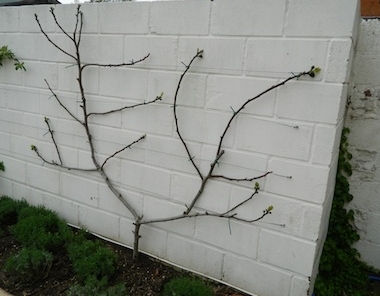 Take some of the younger shoots back to one bud to encourage fresh growth close to the main stems. Tie in the unpruned shoots and pinch out the new growth to five leaves in summer. Ripe figs hang downwards and may have small cracks. Take 30 cm long hardwood cuttings from year old wood and insert them into well cultivated ground. Use rooted suckers removed from the parent plant or layer a low hanging branch. Plant against sunny, sheltered wall or fence, in well prepared alkali or neutral soil. Fan train from two years. Hardwood cuttings, rooted suckers or layering.